A serious accident occurred at the intersection of Northwest 12th Avenue and 50th Street in Miami. The traffic lights were reportedly out due to the damage caused by Hurricane Irma. A Ford Escape and an Infiniti collided at this intersection resulting in three people suffering injuries, according to Local 10 News. If you are approaching an intersection where the traffic lights do not work, Florida law has stipulated that the intersection becomes a four-way stop. This means you should come to a complete stop and proceed when it is your turn. Unfortunately, many drivers that encounter an intersection with non-working lights, they just drive straight thru without even stopping. If you or a loved one was hit by a driver who failed to stop, you can pursue financial restitution for your harms and losses. Compensation for the emotional stress, mental anguish, and other forms of pain and suffering you endured as a result of your injuries. The amount you can expect to recover depends primarily on the extent of your bodily injuries and the amount of available auto insurance coverage. This is why it makes sense to hire an experienced Miami car accident injury lawyer to investigate the accident and recoverable forms of insurance. 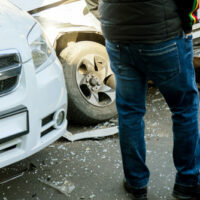 Florida drivers are legally required to carry at least $10,000 in “personal injury protection” (also known as PIP) coverage in their auto insurance policy. Florida is a “no fault” state and the PIP coverage allows you to file a claim for reimbursement of your medical bills and lost wages without having to establish that the other driver was negligent. The PIP coverage is also accessible by passengers and family members who may not have coverage through their own auto insurance policies. PIP coverage is quite helpful, especially when your injuries are relatively minor. However, if you suffered multiple broken bones, a head wound, or spinal cord damage, that $10,000 will likely not cover even a fraction of your economic and non-economic damages. This is when it will be necessary to file a personal injury claim against the other driver to obtain additional compensation. If you were hit by a driver who did not have auto insurance, or a bare bones policy, do not lose hope. You can still pursue a claim for monetary compensation through your uninsured or underinsured motorist policy. Getting seriously injured in a car accident can throw you for a loop and cause both physical, mental, and emotional trauma. The Miami law firm of Alan Goldfarb, P.A. is here to help. Our attorneys have decades of personal injury experience and have represented countless numbers of injured drivers.